One of the unexpected consequences of the Great Russian Partner Swap of 2014 was revealed when it was reported by various Russian media outlets that Brian Joubert had tried out with Katarina Gerboldt with a view to forming a pairs team this week in Moscow. 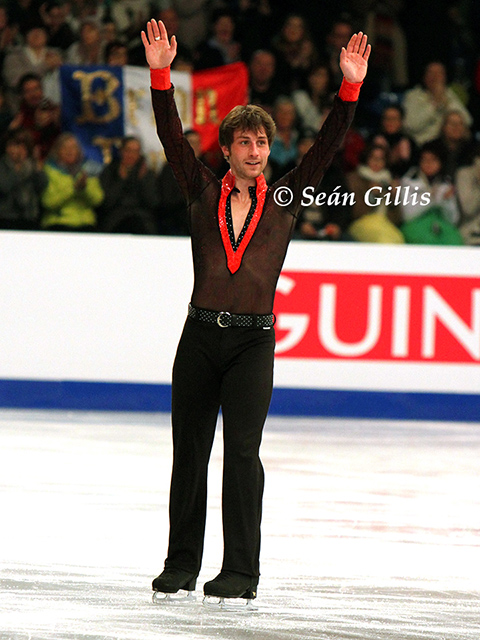 Even before his retirement from singles skating in February, the Frenchman had long expressed an interest in taking up the discipline. Gerboldt had found herself partnerless after a chain reaction of splits that saw Vera Bazarova part ways with Yuri Larionov, Bazarova then team up with Andrei Deputat and his now former partner Vasilisa Davankova bag Alexander Enbert. Enbert previously skated with Gerboldt. The tryout under the supervision of coach Oleg Vassiliev is reported to have gone well and Joubert has now returned to France to discuss with his family and federation this potential new avenue for his skating career. While his late arrival to pairs will no doubt be an obstacle, an even thornier issue could be which country this new pairing will represent. The 2007 World champion has received advice from none other than Gerard Depardieu on the matter. The French film star, who became a Russian citizen last year, hails from the same region of France as Joubert and urged him not to think twice about skating for Russia. Whether the French Ice Sports Federation (FFSG) will be so enthusiastic about this new venture remains to be seen. At a joint press conference on 9 July, the Spanish Ice Sports Federation and the City of Barcelona announced that all-event passes for this season’s Grand Prix Final at the Barcelona International Convention Centre (CCIB) would be available for purchase on the following day 10 July. This will be only the third time that a country other than one of the six Grand Prix event hosts will organise the event and Spanish fans will be hoping to cheer on two-time European champion Javier Fernandez at home. The all-event tickets for the four day competition, which includes both Grand Prix Finals for junior and senior skaters, start from a very reasonable €90 and go all the way up to an eye-watering €2,220 for a VIP box. At the time of going to press, 19 of the latter had already been snapped up and there are only 11 left. If your budget doesn’t quite stretch that far, then don’t worry. There’s still a lot of availabilty in other more moderately priced categories. You can find out all about the ISU Grand Prix of Figure Skating Final 2014 at the official site. Speaking of the Grand Prix, the United States Figure Skating Association (USFSA) has provided us with the first shake-up of the rosters this season. Felicia Zhang and Nathan Bartholomay are out of Skate Canada and NHK Trophy, while Vanessa Lam has been scratched from Rostelecom Cup. Although there has been no official confirmation, given how this season has panned out for pairs so far it can be safely assumed that we probably won’t be seeing Zhang and Bartholomay skating together again. On a happier note, Douglas Razzano and Anastacia Cannuscio and Colin McManus have been added to the entry list for Skate America. This will be the third time for Razzano and second time for Cannuscio and McManus to skate at their home Grand Prix.